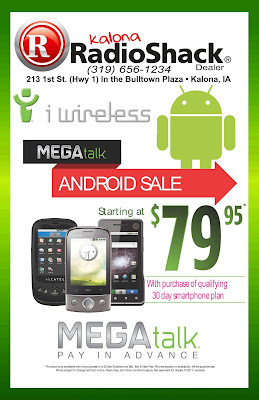 Technology Services of Iowa, LLC: No Contract Androids!! No Contracts!! Come see how your Kalona RadioShack can put a new Android Smart Phone in your pocket without committing to a cellular contract. Come back and see us to purchase phone time as often as you like with 3 day to 60 day refill cards!